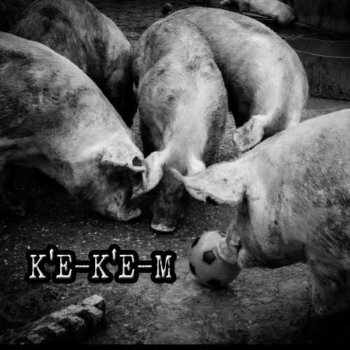 K’E-K’E-M: one of the most interesting punk band from Sardinia! What comes to mind if I say Sardinia? Do you think about beautiful beaches and blue Mediterranean sea? It's not only that... it's a place full of great bands, too! Do you want to be the next featured artist like K'e-K'e-M on LiveTrigger magazine? “There’s nothin’ better than fill up your belly with solid or liquid food and have a laugh. We play with everyone, we don’t worry about the style or scene, we don’t belong to anything”. Tell us something about your last album or your last musical production. Our last album was printed in a limited edition of 400 copies in 12″ vinyl. It’s completely diy, recorded, mixed and mastered by our drummer…. There are 13 songs that recall k’e-k’e-m style with a bit of metal and stoner influences… We can say that our turbo rock’n’roll has taken a “death” way… obviously it’s our best product since the beginning… and the next one will be better and the next one better than the previous and on and on… it is a self-titled album, we use Sardinian language and it’s free for download on Bandcamp site – but you can also make an offer to us. 2 songs are available just in vinyl version. Try to listen it, don’t worry! Our home ground area is Sardinia. It’s an island in the middle of Mediterranean Sea, with beautiful landscapes, beaches, girls, lot of sheep, good food and wine, great culture, great people, but stupid governors!!! There are just few places to play live and our music is not exactly the most liked. Anyway, we don’t care and we still do it ourselves since 15 years. The best live venue for me it’s Bohemien Club in Cagliari. It’s a little place, the sound is not perfect, but the location is great and hot. I think there are too many artist influencing us, just everything you’re listening in a moment of your life could influence your songs….everything has been already written! Tom Waits, Zeke, New Bomb Turks, Down, Melvins, Alice in Chains, Iron Maiden, Dead Kennedys, A Fora De Arrastu. I see A Fora De Arrastu @ Cueva Rock, in Quartucciu, last week. They are a great band and they made a great show, even if there were just 30 people. Our memories on the road are all great, just because they contribute in forming your personality as an individual person and as a band. We knew a lot of great people and a lot of stupid ones, but everyone left something to us! We hope we have left something to them as well! We live in the middle of the Mediterranean Sea, in a beautiful island called Sardinia, so touring is more difficult for us because of the cost we have to cope with and work commitments we have! So that our touring plans usually take just few days… next tour will be around Belgium from 23 to 26 January 2015, and north Italy from 19 to 21 March 2015… and then probably we will have no more touring possibilities during 2015. LiveTrigger is something new and really interesting. I hope that bands all around the world will take part of this project and they will start to communicate with each other through it… LiveTrigger is something that could help everyone involved in music life.